Sometimes you need more complex triggers than a simple pipeline of stages and jobs. In particular, you may want a pipeline to trigger based on the result of a stage in another pipeline. This is possible by adding pipelines as materials. Navigate to the Admin section. 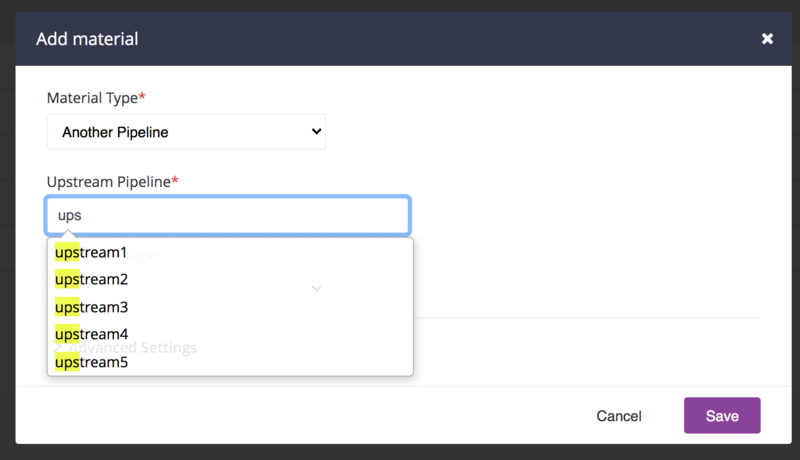 On the Pipelines screen, locate the downstream_pipeline pipeline and Edit it. Add a new pipeline dependency material by clicking Add Material and then selecting Pipeline . Now, when the stage “AutoStage1” of “upstream_pipeline” completes, the pipeline “downstream_pipeline” will start building. 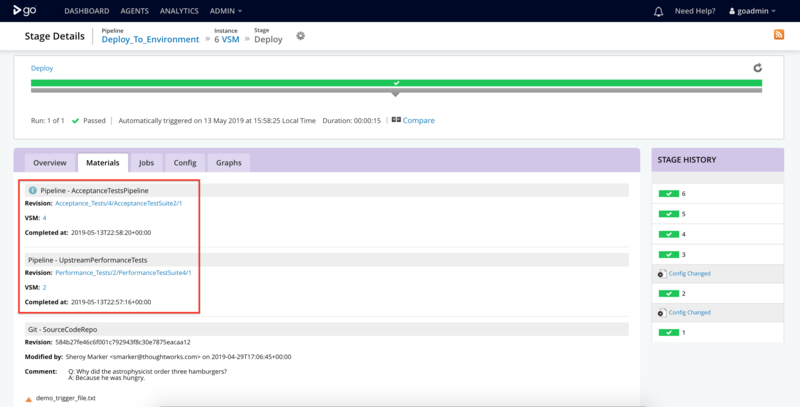 The Pipeline Dependency visualization shows you all the downstream instances that were triggered off the upstream instance (label 14) currently being viewed. If you want to view the materials that are associated with “downstream_pipeline”, the pipeline details page for that specific instance of the downstream pipeline will show you all this information. GoCD can automatically fetch artifacts from a previous stage of the current pipeline or from any ancestor pipeline it depends on. This is useful when a pipeline depends on binaries that are produced earlier in the pipeline. Note that you can not specify two (or more) dependencies for the same upstream pipeline. For example, in the following configuration, when the stage “AutoStage1” of pipeline “upstream_pipeline” passes, the pipeline “downstream_pipeline” starts, and the artifacts are fetched from the upstream pipeline in the stage ‘Stage’ of “downstream_pipeline”. You can see the exact pipeline and stage that triggered this in the sub-tab ‘Materials’ on the stage details page. 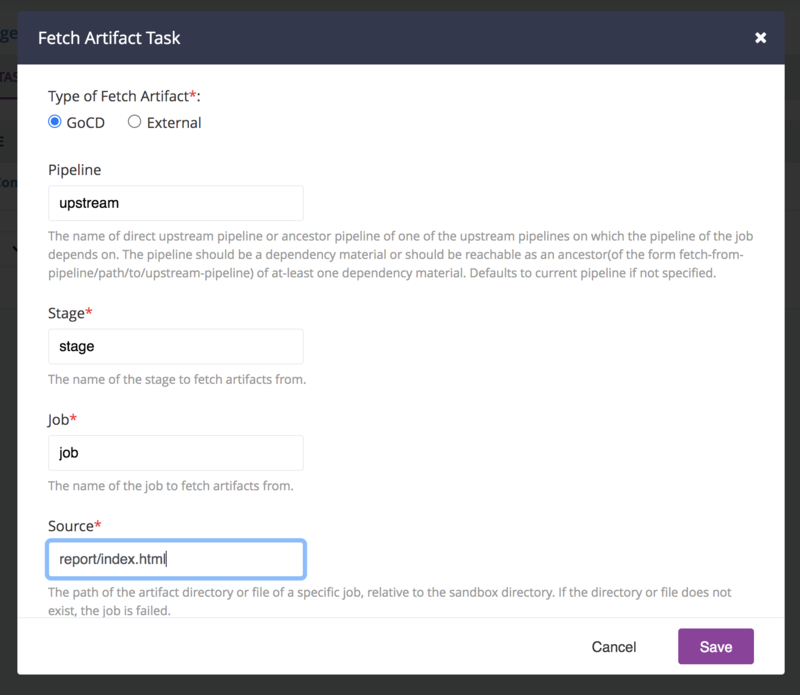 Then, you’ll want to retrieve (fetch) that artifact from within the “downstream_pipeline.” You can do this by creating a “Fetch Artifact” task within a job in that pipeline. Since you have already defined “upstream_pipeline” as a dependency material, artifacts from that pipeline are accessible in this pipeline. A fetch task can also be instructed to retrieve (fetch) an artifact from an ancestor pipeline. For example, lets assume that the “upstream_pipeline” used in this example, depends on another pipeline “topmost_pipeline”. 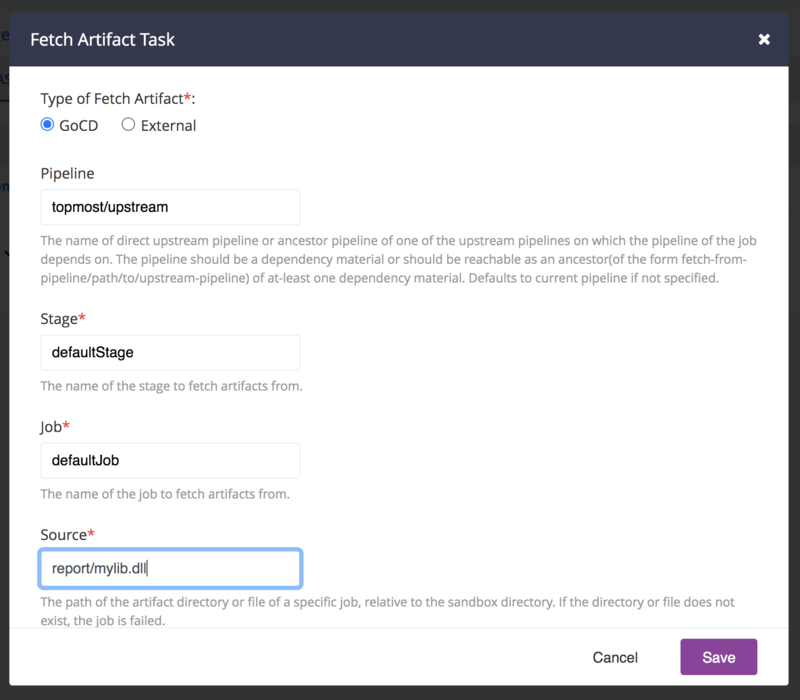 Then you can define a a “Fetch Artifact” task to fetch artifacts from “topmost_pipeline” by defining the hierarchy of these pipelines as follows. You have to specify the hierarchy by separting the pipelines with a /. For example: topmost_pipeline/upstream_pipeline.